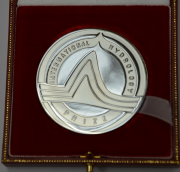 During the General Assembly in Vienna the International Hydrology Prize was awarded to Professor P.S. Eagleson, MIT Cambrigde, USA for his important and long standing contributions to Hydrology. Pete Eagleson is one of the scientists who strongly advocates a close cooperation between meteorologists and hydrologists e.g. in studying the impact of climate change. Further Pete Eagleson was chairman of the Committee on Opportunities in the Hydrologie Sciences (National Research Council - USA) which has published a report with the same title. Pete Eagleson was also member of the IAHS/UNESCO Panel on Hydrological Education. This Panel has published its report: The Education of Hydrologists in December 1990. Because Pete Eagleson was not in the position to take part in the Vienna Assembly the prize has been made during the AGU conference in San Francisco December 1991.